Our reinsurers hold more than 5x the policyholder surplus of the Top 4 underwriters combined. All of our reinsurance partners have a substantially better ratings than any title insurance underwriter, with each having an AM Best rating of A- (Excellent) or better. Our conservative approach to protecting our policy holders is accomplished through reinsurance agreements with Lloyd’s of London. When validating a CPL from our website, please enter the identification code EXACTLY as it appears on the letter. We’ll do our best to resolve your claim quickly and with the level of personal care you would expect from the underwriter who believes in helping others first. We want to provide all the information you need to understand our unique approach to managing risks to your company and to your customer’s experience. We’ve held our SSAE 18 SOC1 Type II certification for four consecutive years, time and again verifying our processes for approving, monitoring and reviewing independent agents. We’re the only title insurance underwriter to receive an ISO 27001 certification, validating that we adhere to rigorous standardization requirements for information security. Water title insurance requires unique expertise, including an in-depth understanding of water interests, land titles, and underwriting practices. We can support you on your commercial deals as well as residential ones. As long as we’re is in your corner, you’ll never go through a title claim alone. Our team of experienced professionals will help you along every step of the way. 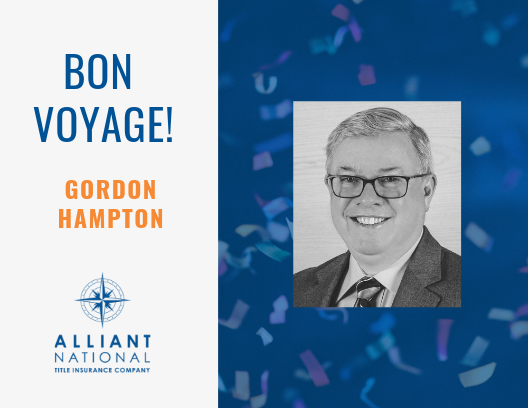 Alliant National Title Insurance Controller Gordon Hampton Retires. Thank you for being an amazing example through the years. Your dedication and hard work are really inspiring. You will be missed, but enjoy your retirement! 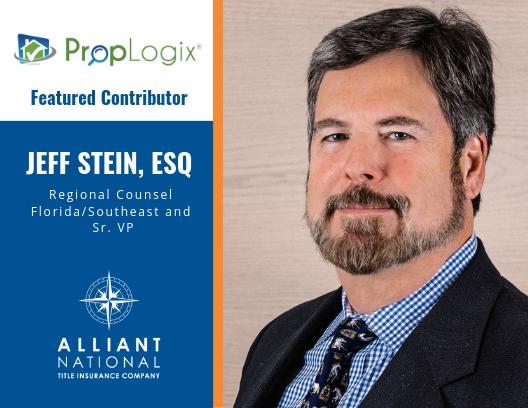 Alliant National’s Regional Counsel Jeff Stein was a featured contributor in PropLogix’s Title Industry Insights for 2019. 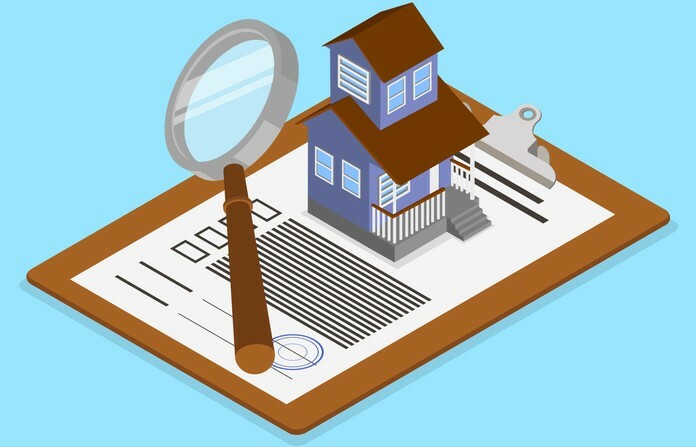 For the article, title insurance leaders share perspectives on topics that should be top of mind for settlement agents in 2019. The story explores strategies and practices for title agents, including wire fraud prevention, marketing, e-closings and blockchain. 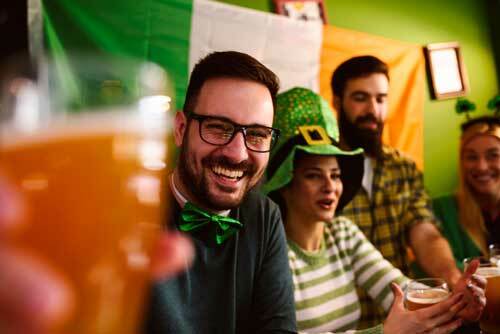 Did you know St. Patrick’s Day is celebrated in more places throughout the globe than any other national festival? Show us how you celebrate! Submit a photo of yourself enjoying a St. Patrick’s Day celebration to marketing@alliantnational.com for a chance to win a prize. Photos will be uploaded to a photo album on the Alliant National Facebook page as we receive them, and fans of the page will have a chance to vote for their favorite photo. You can invite your Facebook friends to vote for your favorite entry also. I’ve had the privilege of representing title insurance companies and their insureds for the past ten years. Each claim represents a unique challenge. With the benefit of hindsight, I have reached some conclusions that may assist agents and local counsel in avoiding claims. The agent receives a payoff statement from the seller. The seller sends an email requesting the payoff from the lender and copies the agent on the email. The agent relies on the email and the payoff statement to wire funds to the lender. Later, it is discovered that the email address for the lender is fake, and the bank account receiving the payment was held by the seller, not the lender. The agent reaches out to the lender for a payoff statement. However, the closing date is approaching, and the lender has not responded. The seller provides the agent with a printout showing a zero-balance owed on the account. The agent contacts the lender once again for a payoff statement. The lender confirms over the phone that a zero balance is owed. The agent closes the transaction based on these representations. Later, it is determined the original lender confirmed a zero-balance due because the loan had been sold to another lender. An assignment of the mortgage had been recorded, and the current holder of the notes filed to foreclose. 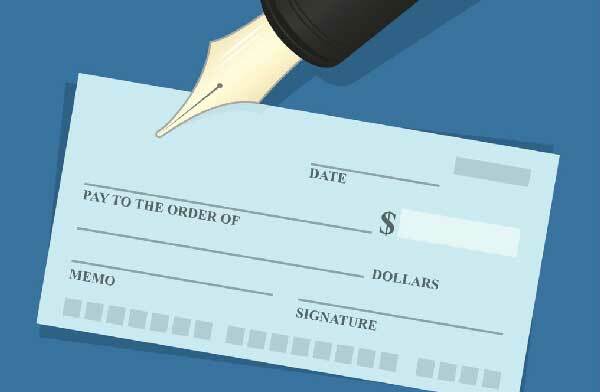 Always obtain a payoff statement directly from the lender. Do not rely on payoff statements provided by other parties. Your request for a payoff should include a letter of authorization from the borrower, the loan number, the property address, the borrower’s name and your fax number or email address. Only rely on a payoff statement sent by the current holder of the note. Check the MERS system, (if the mortgage is a MERS loan), and the public records for the last assignee. Obtain separate payoff statements directly from each lender with an interest in the property being sold or refinanced. Do not rely on representations from the borrower or other institutions regarding the balance of a loan. LONGMONT, Colo. – Alliant National Title Insurance Company, a unique title insurance underwriter that partners with Independent Agents to improve their competitive position in the marketplace, announces the successful completion of the Service Organization Control (SOC 1) SSAE 18 Type II examination for the fifth consecutive year. 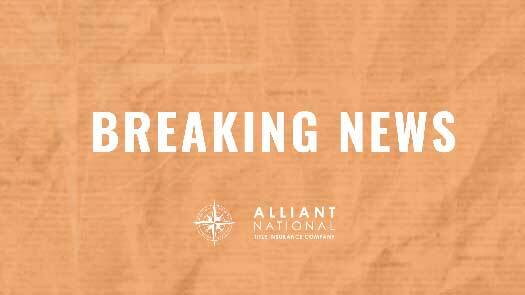 The examination results in an AICPA endorsed report stating that Alliant National Title Insurance Company has maintained effective controls over its Agent Quality Management System. A-Lign Certified Public Accountants of Tampa, Fla., performed the engagement and certification. The successful SSAE 18 Type II examination validates Alliant National’s processes for approving, monitoring, and reviewing its agents, which results in its agents being designated as Authorized Service Providers or Certified Service Providers of Alliant National. Under this framework, Alliant National’s Independent Agents are reviewed annually against rigorous quality standards. Lenders relying upon Alliant National’s oversight of its agents and Authorized and Certified Service Provider programs receive additional assurance that processes and controls are designed and function properly and accurately. Alliant National was certified to the SSAE 16 Type I standard on Dec. 1, 2013 and received compliant status to the more rigorous SSAE 16 Type II standard effective Aug. 31, 2014 and each year through December 31, 2018. That makes 2018 the fifth consecutive year of continued compliance to SSAE Type II standards. The unqualified report was issued without exceptions. LONGMONT, Colo. – Alliant National Title Insurance Company (Alliant National) recently announced that Senior Vice President and Southeastern Region Agency Manager Tracey Webb, a title industry leader for over three decades, received the National Title Professional (NTP) designation from the American Land Title Association. The American Land Title Association advises the NTP designation is designed to recognize land title professionals who demonstrate the knowledge, experience and dedication essential to the safe and efficient transfer of real property. Webb, who graduated from Texas A&M University with a Bachelor of Business Administration, is also a Certified Public Accountant and is responsible for Alliant National’s agency group in the southeast. Visit alliantnational.com/newsroom for additional information. The Independent Underwriter for The Independent Agent®, Alliant National believes in putting other people first. The company protects the dreams of property owners with secure title insurance and partners with 450+ trusted independent title agents as a licensed underwriter in 24 states and the District of Columbia, with annual revenues exceeding $120 million. 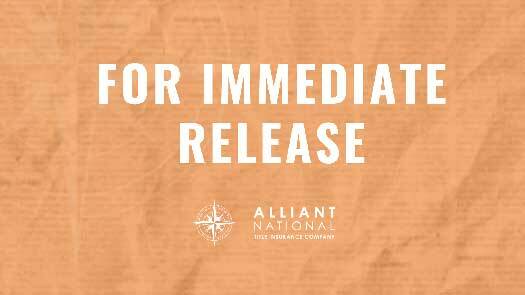 Visit alliantnational.com/newsroom for additional information. We have a staff of nearly 80 dedicated professionals now, with diverse skill sets and backgrounds, who share a desire to help people and their businesses thrive. Protect the dreams of property owners with secure title insurance provided through the finest independent agents in a trusted partnership. For more information about Alliant National or to get in touch with one of our representatives, please drop us a line. or drop us a line on our contact page.